⟩⟩⟩ Transmitting live video over adsl/fiber internet connection to any location in the world. Reception over TV set. 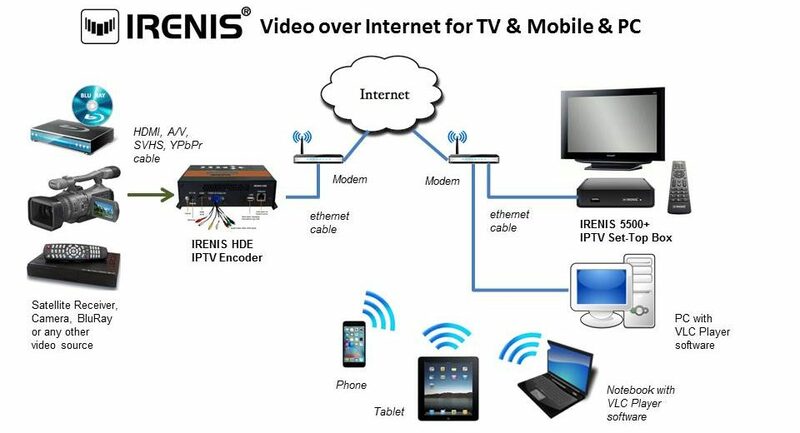 Using IRENIS encoder and IRENIS IPTV Set-Top Box you can transport any HDMI or Audio/Video signal in real time over internet in HD quality. You can watch the signal with your TV over STB, with any PC, with any mobile phone or tablet pc including Apple iPhone/iPad devices. IRENIS HDE IPTV encoder is designed for TV signal distribution, IRENIS 5500+ IPTV STB for TV signal reception in excellent quality over LAN and internet. Suitable for WLAN access points use on both sides. You can optionally purchase a WLAN adapter for the IRENIS 5500+ STB and operate it through wireless connection.